Small Double - 4ft x 6'3"
An intoxicating mix of stone and dove grey cushions with a hint of khaki greens. 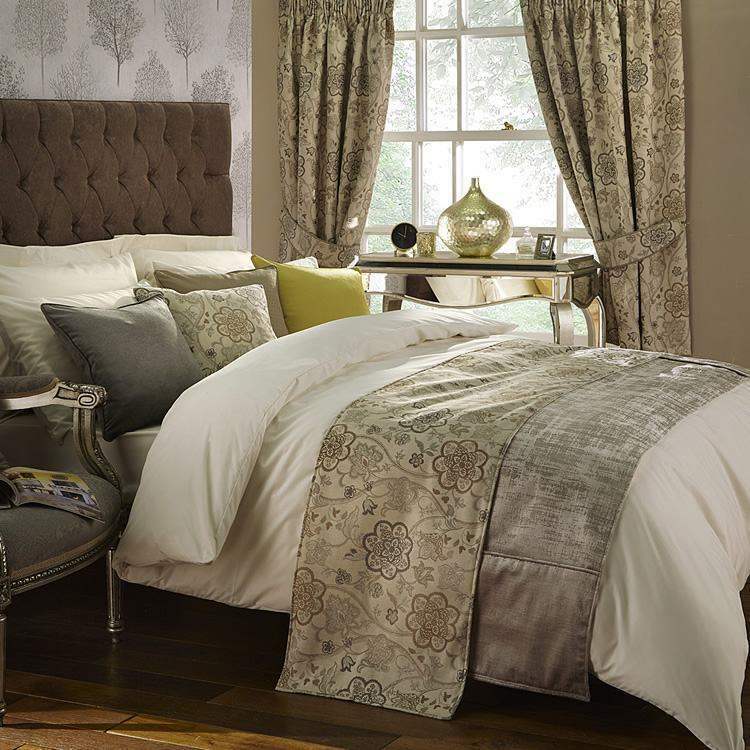 Mixed with double bed runners to stunning effect. Designed and made exclusively by Victoria Linen. We mix and match vibrant cushions and bed throws to make truely unique bedding. Choose from our range below to create your own style or buy the set! Available in a wide range of UK standard, European and non standard sizes up to Caesar bed sizes. Samples of all our fabrics are available. For more information please call 01706 220020 or drop us an email. Duvet Cover & Pillow Cases in 400 Thread Count Cotton Beautifully Soft 400 Threads to the i..
45cm Alaska Cushion - GreySoft, feather filled cushion in soft Alaska Grey. Fully piped. Size: 45 x ..
45cm Cushion in Genevieve Dove GreySoft, feather filled cushion. fully piped. Size: 45 x 45cm..
45cm Georgia Cushion - StoneSoft, feather filled cushion in soft Georgia Stone. Fully piped. Size: 4..
45cm Glint Cushion - ButtercupSoft, feather filled cushion in soft buttercup. Fully piped. Size: 45 ..
Alissa Bed Runner Luxury Faded Design Bed Runner made in a wide range of bed sizes.Bed throw in..
Genevieve Bed Runner Luxury Floral Design Bed Runner made in a wide range of bed sizes.Bed thro..